Enjoy fresh, healthy and all-natural pasta right in the heart of your home. One of the most popular pasta makers that Marcato offers is the Marcato Atlas 150 Pasta Maker, or the Marcato Pasta Machine 150. The heavy duty steel construction and lack of any electronic components make the machine simple to use and long-lasting kitchen tool that rarely needs repairing. 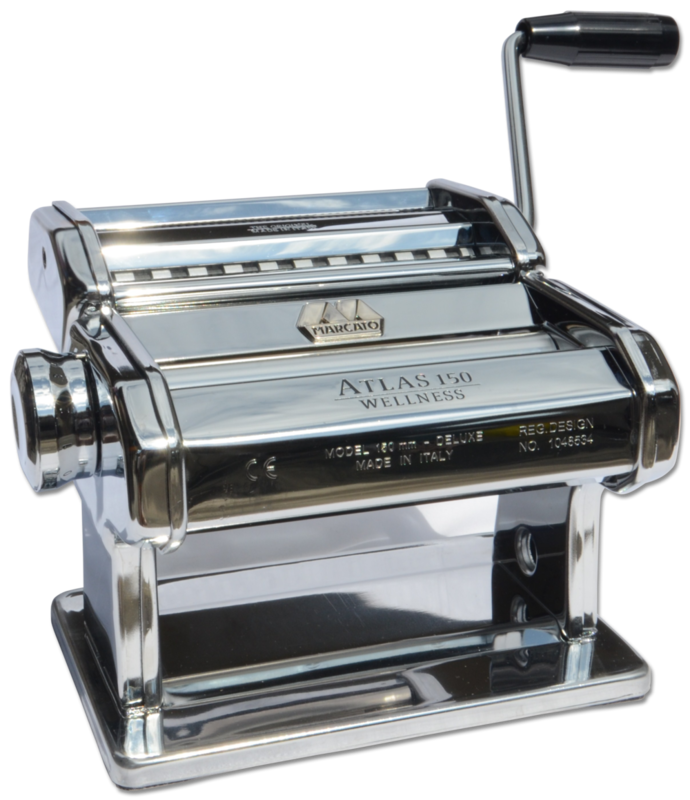 The Marcato pasta machine is absolutely the most versatile manual pasta machine available on the market today and also the most widely sold. Attachments applicable to the body of the Marcato pasta machine allows for obtaining different types of pasta. The whole Marcato range uses Wellness rollers made in a special light alloy, a Marcato exclusive patent ensuring your homemade pastry is 100% wholesome. The outcome features no residue on the pastry, no oxidation or change when coming into contact with water, and it’s extremely easy to clean. Affix the machine onto the table or work surface with the clamp provided and insert the handle into the roller hole. When using the machine for the first time, clean it with a dry cloth to remove any excess oil. To clean the rollers, pass a small quantity of dough through them and then throw the dough away. Set the machine regulator to position 1, pulling it outwards and turning it so that the two smooth rollers are completely open (approx. 3 mm). Pass a piece of mixture through the machine while turning the handle. Repeat this operation 5 to 6 times, folding the dough over and adding some flour to the middle if necessary. When the dough has taken a regular shape, pass it through the rollers once only with the regulators set on number 2 (approx. 0.2 mm). When using a cutter that makes round spaghetti, set the regulator on number 5. With a knife, cut the dough crossways in pieces approximately 25 cm (10") long. Insert the handle in the hole for the cutting rollers, turn it slowly, and pass the dough through so as to obtain the type of pasta you prefer. Note 1: If the rollers won't cut, it means the dough is too soft. In this case, add flour to the mixture, then pass the dough through the smooth rollers repeatedly until the right texture is achieved. Note 2: If the dough does not get "caught" by the cutting rollers, add a little water to the mixture, then pass it through the smooth rollers repeatedly until the right texture is achieved. Place the cut pasta on a table cloth or drying rack, and leave it to dry for at least an hour. Fresh pasta will keep for 1-2 weeks if stored in a cool, dry place. Bring a pan of salted water to a boil (4 liters per 1/2 kg of pasta) to which you will add the pasta. Fresh pasta cooks in just 2-5 minutes, depending on its thickness. Stir gently and then drain the pasta once it has finished cooking. To remove cutting attachments, lift up, making it slide up along its tracks. To install attachments, slide them down on the tracks. During use, keep the scrapers underneath the smooth rollers clean with parchment paper. Never wash the machine with water or in the dishwasher. To clean the machine after use, use a brush or a wooden rod. If necessary put several drops of vaseline oil or mineral oil on the ends of the cutting rollers. Do not insert knives or cloths in the rollers. After use, replace the machine and its accessories in the original box.